In embarrassing Libra fashion, I must have changed my mind w/r/t the type of cake I wanted to make for the now annual Libra birthday party at least five times. Last year’s entry was a hit, so I was feeling the follow-up pressure, it’s true. But more than that, there’s also finally a full-on fall chill in the air, so I wanted something more rich and comforting than sharply sugary. Kitten and I wait for the cake to bake. Which one will it be? Still, the options were myriad. First, there was the red wine and chocolate idea, then the bundt cake thought, a browse or two through the photos on Tastespotting, a passing fancy with Baked’s White Out cake (which I thought might compliment Rebecca’s trial of the salty chocolate and caramel one) but just reading about the icing made my teeth hurt. Whether deemed too sweet or not fancy enough for a celebration, nothing felt like it would fit comfortably in with a casual evening house party in October. 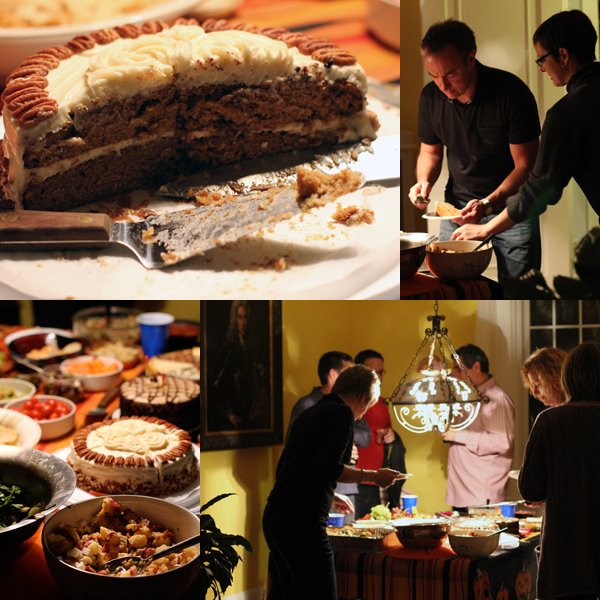 Then I remembered that cream cheese and maple syrup frosting, and landed pretty quickly on this pumpkin cake. Seems this David Leite recipe has already done a do-se-do or two around the internet, but it’s definitely worth another dance. *For all those who grew up with Captain Zoom’s birthday message from the moon, a nostalgia ride can be found here. Bring butter and eggs up to room temperature. Preheat the oven to 350°. You’ll need two cake pans (8-inch if you have them, but 9-inch won’t ruin your cake). Butter each pan, line the base with parchment paper, butter that surface, and flour the entire interior of both pans. Measure out the sugars into one bowl, and the remaining dry ingredients into another. Run a whisk around each bowl to evenly incorporate. Beat the butter and sugars together on medium speed until fluffy. Add the eggs, one at a time, scraping down the sides (and bottom! I had some sugar that got stuck there) of the mixing bowl after each addition. Alternate adding the flour and milk mixtures, beginning and ending with the flour. Beat in the pumpkin until smooth. 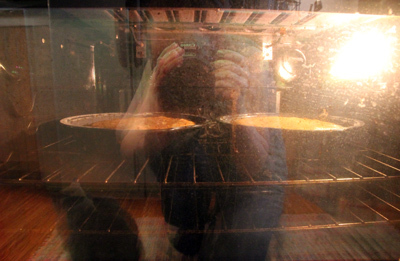 Divide the batter equally between the pans. Bake the cakes until a toothpick inserted into the center comes out clean, about 30 minutes. Cool the cakes on racks in the pans for 10 minutes, then remove, peel off parchment, and allow to cool completely. 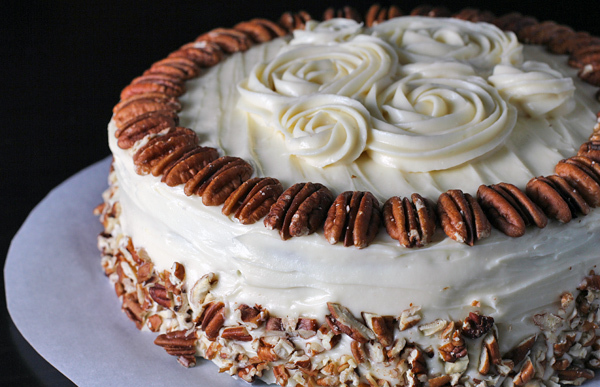 Beat all the ingredients (minus the pecans) on medium until fluffy. Place bottom layer of cake on serving plate or stand, frost the top, and place the remaining cake on top. Continue frosting the sides and top, garnish with nuts and remaining icing (rosettes are actually really easy to do), and refrigerate the cake for 30 minutes to allow the frosting to set. Wow! Molly, this looks incredible. I hope everyone enjoyed it. I am salivating just looking at the photos.